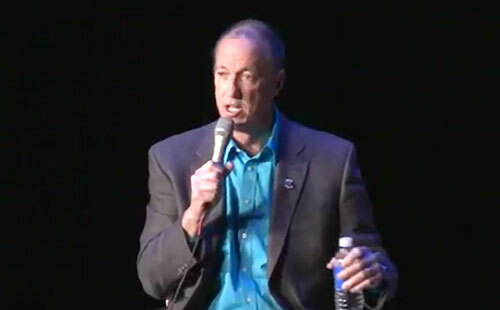 FORT WAYNE, IN –- Former Buffalo Bills quarterback, Hall of Famer and cancer survivor, Jim Kelly and his wife, Jill were the guest speakers on Monday April 27 and Tuesday April 28, 2015 at the Embassy Theatre in Fort Wayne for “A Night of Hope” presented by the Fellowship of Christian Athletes. Source: Wane.com. Kelly played his entire NFL career from 1986-1996 with the Buffalo Bills. As quarterback, Kelly led one of the great NFL scoring juggernauts which led to four consecutive Super Bowls, from 1991 to 1994; however, each time the team lost. He was inducted into the Pro Football HOF in 2002 in his first year of eligibility. Jim’s son, Hunter, passed away to Krabbe disease at the age of eight. Jim and Jill started the Hunter’s Hope foundation to honor their son’s life and raise awareness about his disability. In 2013, Jim was diagnosed with cancer in his upper jaw. He battled the disease twice, and as of August 2014, he remains cancer free. Sports Speakers 360 is a booking agent for pro athletes. If you would like to book Jim Kelly for a speaking engagement, appearance or endorsement, contact Jim Kelly’s booking agent for fees at 1.855.303.5450.